An organization tied to leftist billionaire George Soros and founded by former staffers of Hillary Clinton’s failed 2016 presidential campaign has pitched its tent in Florida to “help out” with the recount effort for Democratic Sen. Bill Nelson. Days after Nelson appeared to have lost on Nov. 6 to Republican Gov. Rick Scott, a recount was ordered. Demand Justice, which formed earlier this year, was prominent in helping to lead the opposition to Supreme Court Justice Brett Kavanaugh. The group recently advertised that it is seeking supporters who are either in Florida or who can travel there, Breitbart News reported on Nov. 11. 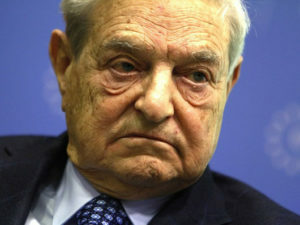 A recent Daily Caller investigation found that Soros’s Open Society Policy Center (OSPC) previously donated some $2.2 million to the Sixteen Thirty Fund. Even before President Donald Trump announced Kavanaugh as his Supreme Court nominee, Demand Justice committed to spending about $5 million to oppose the nominee. Demand Justice was founded by Brian Fallon, who served as press secretary for the losing 2016 Clinton campaign.